The biopesticides market has been experiencing a rapid growth in recent years; however, plant- and microorganism-based biopesticides have been used for centuries for controlling pests. According to 17th century records, plant extracts such as nicotine were some of the earliest agricultural biopesticides used to control plum beetles and other pests (BPIA, 2017). Experimentation involving biological controls against lepidopteran pests were performed as early as 1835, during Agostine Bassi's efficacy demonstrations of the white muscardine disease caused by a fungus now known as Beauveria bassiana against lepidopteran pests (BPIA, 2017). Further, the use of mineral oils as plant protectants was cited in experiments during the 19th century (BPIA, 2017). In the early 20th century, an increasing number of studies involving biopesticides emerged during the rapid institutional expansion of agricultural research (Stoytcheva, 2011). The bacterium Bacillus thuringiensis (Bt) was the initial biopesticide and has the most widespread use to this day. In 1901, Bt was isolated from a diseased silkworm by Japanese biologist Shigetane Ishiwata. Ten years later, German researcher Ernst Berliner rediscovered it in a diseased flour moth caterpillar (BPIA, 2017). Other commercial success stories from the 1980s and 1990s involve the use of Agrobacterium radiobacter to prevent crown gall on woody crops (Escobar and Dandekar, 2003) as well as utilizing Pseudomonas fluorescens for the prevention of fire blight in orchards with streptomycin-resistant pathogen populations (Stockwell et al., 2010). Resurgence in academic and industrial research for biopesticide development occurred in response to rising costs associated with the overuse of synthetic chemicals. Increasing biopesticide adoption has resulted, in part due to rapid expansion of organic agriculture during the past decade (Eze et al., 2016). As a result, the development of new biopesticides has continued to increase since the mid-1990s. Over 100 active ingredients have been registered with the United States Environmental Protection Agency (USEPA) Biopesticides Division since 1995 (EPA, 2017). 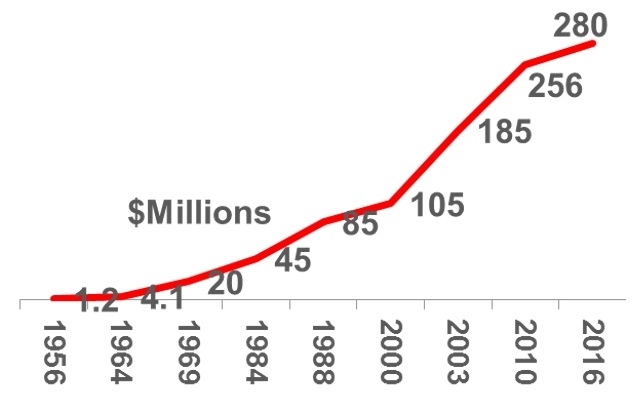 The increasing cost of developing chemical pesticides (Fig. 1) could also have contributed to the rise in biopesticide registration (McDougall, 2016). Biopesticides currently represent approximately 5% of the total pesticide market (Olson, 2015). However, the biopesticides market is experiencing rapid growth of about three times the rate associated with conventional agricultural chemicals (Chandler et al., 2011). The trend toward the use of biopesticides is growing stronger for two major reasons; the first is the fact that biologicals alone and in combination with chemicals have the potential to provide superior yields and quality (Yadav et al., 2013; Dara, 2015 & 2016; BPIA, 2017;). Secondly, increasing regulatory restriction on chemicals has established restrictive barriers to bringing new products to market while countries such as Europe simultaneously are eliminating pesticide active ingredients at a rapid rate (Erbach, 2012) (Fig. 2). Fig.2. 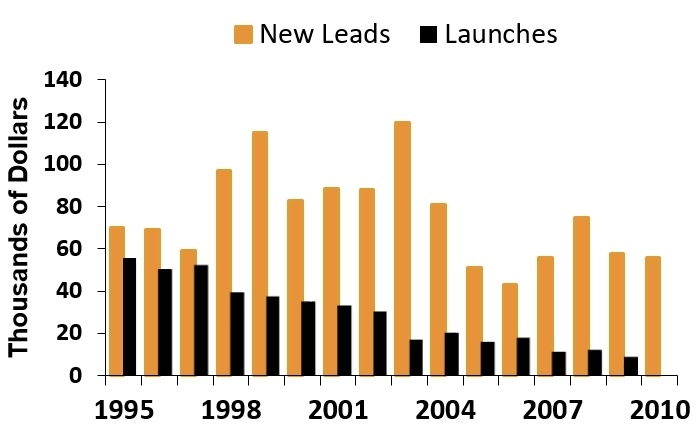 Numbers of new agricultural chemical leads and launches from 1995-2010 (Based on data from Ag Chem New Compound Review, 2010). Over 200 biopesticide products are currently sold in the US, in comparison to only 60 comparable products in the European Union. Overall, more than 225 microbial biopesticides are presently manufactured within 30 countries that belong to the Organization for Economic Cooperation and Development. Approximately 45% of the total biopesticide use occurs in USA, Canada, and Mexico, whereas Asia uses around 5% of biopesticides sold globally (Kumar & Singh, 2016). According to Berkshire Hathaway, the global biopesticides market is projected to reach a value of $8.8 billion by 2022, representing annual average growth of 17% from 2016 (Brzoskiewicz, 2018). Primary growth factors affecting the biopesticides market include growth in crop production, ease of application, increase the in need for organic food, and growing preference for sustainable pest control methods. Although biopesticides currently account for approximately 2% of the plant protectants used globally, the growth rate indicates an increasing trend during the past two decades, wherein the global use of biopesticides is increasing steadily by 10% every year (Brzoskiewicz, 2018). Biostimulants are a recent emergent area within which functionality and regulatory guidelines may not be as well-defined as those for biopesticides. A plant biostimulant is defined as “any substance or microorganism applied to plants with the aim to enhance nutrition efficiency, abiotic stress tolerance and/or crop quality traits, regardless of its nutrients content” (du Jardin, 2015, p. 3). Chatzikonstantinou (2017) regarded fertilizers and biostimulants as being a part of the same family, with reasoning based in their similarities for helping plants to simulate nutrients, boosting tolerance to abiotic stress factors, and increasing the quality of crops. There are currently no federal statutory definitions for biostimulants in the US, and uncertainty exists in both federal and state regulatory agencies in terms of how to develop guidelines for plant biostimulant categories (Russell, 2015). Ag Chem New Compound Review. 2010. Vol 28. Chandler, D., A. Bailey, G.M. Tatchell, G. Davisdon, J. Greaves, et al. 2011. The development, regulation and use of biopesticides for integrated pest management. Phil Trans R Soc B 366: 1987–1998. du Jardin, P. 2015. Plant biostimulants: Definition, concept, main categories and regulation. Sci Hort 196: 3–14. Dara, S. K. 2015. Root aphids and their management in organic celery. CAPCA Adviser 18(5): 65-70. Dara, S. K. 2016. IPM solutions for insect pests in California strawberries: efficacy of botanical, chemical, mechanical, and microbial options. CAPCA Adviser 19(2): 40-46. Erbach, G. 2012. Pesticide legislation in the EU: Towards sustainable use of plant protection products. Library briefing, Library of the European Parliament 120291REV1: 1-6. Escobar, M.A. and A.M. Dandekar. 2003. Agrobacterium tumefaciens as an agent of disease. Trends Pl Sci. 8(8): 380-396. Eze, S.C., C.L. Mba, and P.I. Ezeaku. 2016. Analytical review of pesticide formulation trends and application: The effects on the target organisms and environment. Int Jour Sci Env Tech 5(1): 253-266. Stockwell, V.O., K. B. Johnson, D. Sugar, and J. E. Loper. 2010. Control of fire blight by Pseudomonas fluorescens A506 and Pantoea vagans C9-1 applied as single strains and mixed inocula. Phytopath 100(12): 1330-1339. Stoytcheva, M (ed.). 2011. Pesticides: Formulations, effects, fate. Intech, Rijeka, Croatia. Sort of wondering if Berkshire Hathaway is eating its own cooking? With a predicted annual growth rate of 17% to 2022 in the biopesticide sector, that would be a major signal to start buying with both hands, but I haven't seen that yet on their part. Could be a lack of familiarity by a notoriously cautious investment group with the technology, but still that rate of return would make it well worth the risk. Thanks for the tip!